Haiku! Gesundheit? - Stop staring and start sewing! Thank you for all your nice comments (begging comments included!) on my last post! I feel like Sally Fields ("You like me! You really like me!") today. 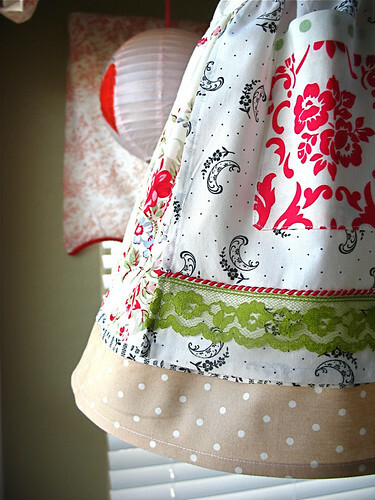 The winner of the apron pattern and cherry fabric drawing was #110 (out of 190 comments, dang! ), Shelley Jo. Yippy for Shelley Jo! I'm going to send an envelope full of various scraps to Karen (enough for a whole bunch of scrappy squares). Fun! We are getting close to finishing my next pattern and I'm really happy with it. I've added a pocket option and some tutorials on how to spice up a top to wear with it. I think I have a name for it but I won't really know until it's born and I look at it's face (if you know what I mean). Here's my newest rendition. And I had a chance to sew for fun yesterday. 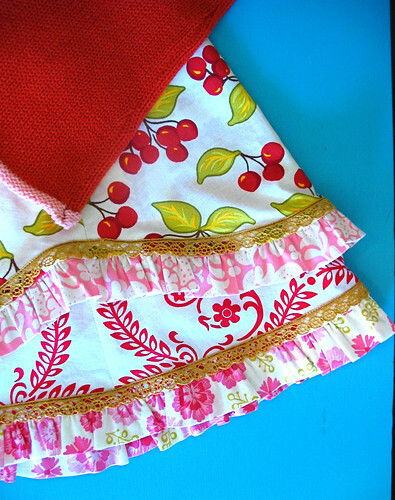 I made this cute Insa skirt (Farbenmix) with Sandi's vintage cherry fabric. I found 4 of these great sweaters made by Timberland (acrylic I think) at a clearance store last year. I always intended to make coordinating skirts but as with most things, it took me awhile to get around to it. I even made a matching pin to jazz up the sweater. I love it (it's in my store now, with some other samples I just added)! I shortened the outer layer by about an inch because of the added ruffle (I wanted more of that cute Sis Boom fabric to peek out). Oh and for those of you not on my mailing list (what?! ), I just got my last 4 bolts of Farmer's Market this week so now I have the whole line. And to celebrate, I've dropped the price to 7.00 yd until the 27th. Go crazy! And Flirt is still on sale until the end of September. Again, go crazy (can you tell I need to make room here)! 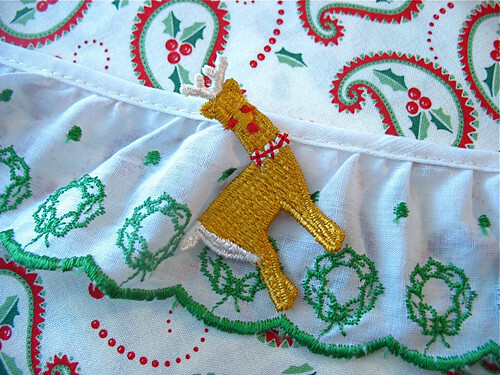 I just added a couple of Christmas trims too. I took pics awhile back and then forgot. But, they're cute and interesting (and Christmasy! ), and they look nice with Mary Engelbreit's fabric. Oh, and I'm getting the next Mary Engelbreit line (Recipe for Friendship) from Moda in a couple of weeks. 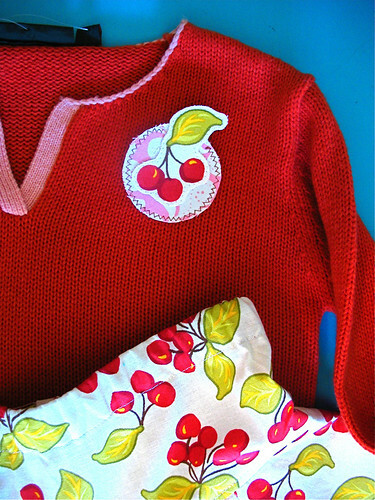 It has lots and lots of cherries (and paisleys with cherries in them!). Cute times ten and oh so Mary (I love her)!